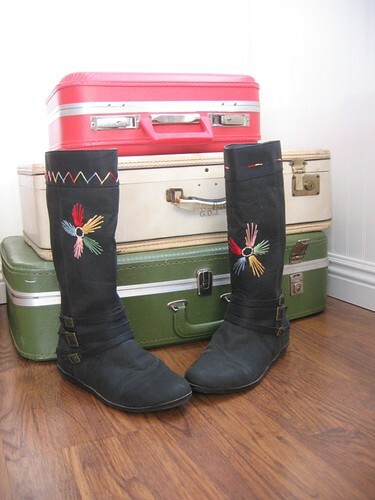 LOVE, LOVE these boots. Want them so bad. I wonder how hard it was to stitch thru that leather. I am loving these! How original. ooooh these are sick! love them! I found a pair of wooden soled, wool uppers clogs at the dump sharing shed a few weeks ago. Plain gray with a couple of teeny (moth?) holes. I plan to embroider some sort of design on those soon. oooh! I love these boots. Who makes those? I love the stitching but also love those buckle boots. These are just AWESOME, pure and simple!